Do you have an old heating and cooling system that just isn’t running as well as it should? Have the extreme temperatures of summer or winter caused your system to break unexpectedly? If either of these are true, you’re probably in the market for new heating and cooling equipment. Purchasing a new heating and cooling system is a huge investment. It can often be compared to purchasing a new car. You want a system that is both affordable and that can provide the service you need to keep your home or business comfortable efficiently. Spring and fall are especially good times to look for factory rebates. These are usually ideal times to install new equipment before the extreme temperatures of summer or winter set in. In addition to rebates, you may also find special promotions offered from the factory. These can range from discounts to cash back from referring other customers. 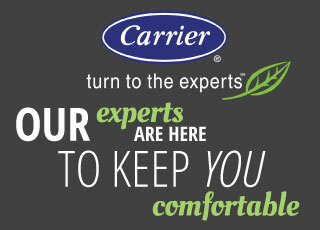 As a Carrier® Factory Authorized Dealer, we are well informed of any special promotions or rebates offered from the factory. We are more than happy to pass these savings on to our customers and are glad to answer any questions you may have. Your heating and cooling system should be an asset to your family’s comfort, not a burden. And making your equipment as affordable as possible can play a huge role in achieving that. Contact G&M Service to learn more about the factory rebates offered from Carrier®.